Home›Movie Reviews›Star Wars Episode VII: The Force Awakens - A Long Awaited Return to a Galaxy Far Far Away! 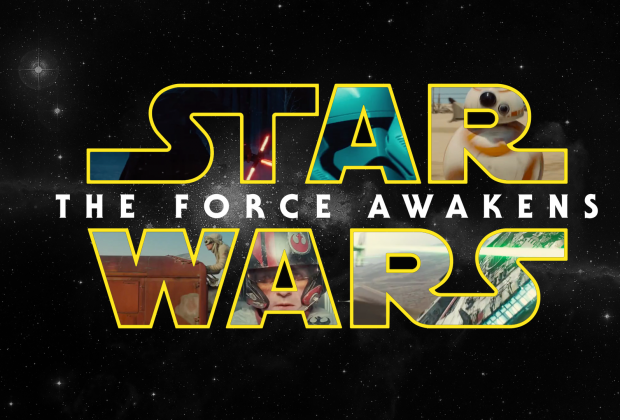 Star Wars Episode VII: The Force Awakens - A Long Awaited Return to a Galaxy Far Far Away! This review contains minor spoilers for older Star Wars films. There are NO spoilers for The Force Awakens, aside from a few brief comments in one paragraph near the end, which has been denoted. The Star Wars saga continues. Following the much ill-received Star Wars Prequel Trilogy, it was unknown if audiences would ever see another film in the series. For that matter, after the hit-and-miss nature of said prequels, did audiences even want another movie? 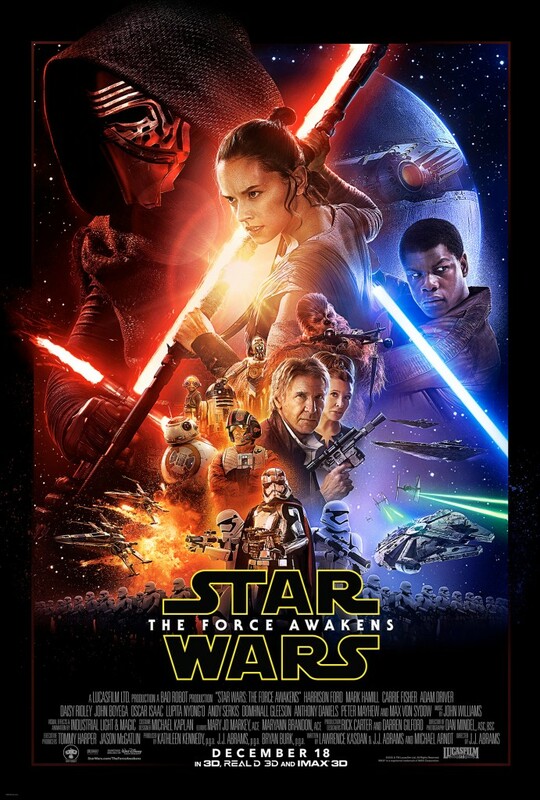 Star Wars Episode VII: The Force Awakens is the seventh live-action theatrical film in the long running franchise. It is directed by JJ Abrams and scored by John Williams, and features old and new characters/actors alike. This has been a hectic year (in a good way!) for Star Wars fans. 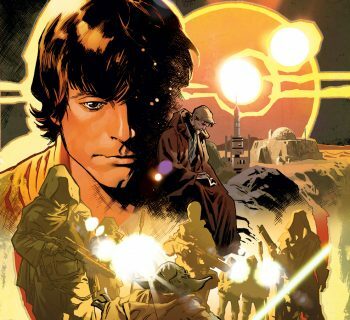 In addition to the release of the new movie and the endless hype, Marvel has regained the comic rights and released countless stories and series, and a number of authors have released books in the new continuity sanctioned by the LucasFilm Story Group. There has even been a new Star Wars Battlefront game released. But if you are here, you want to know how the new movie measures up. Does Star Wars Episode VII: The Force Awakens recapture the feel of the legendary Classic Trilogy, or is it another disappointment along the lines of the oft-maligned prequels? Star Wars Episode VII: The Force Awakens is set 30 years after Return of the Jedi. The Galactic Empire has been defeated. Darth Vader and Emperor Palpatine are dead. But in the intervening years, Luke Skywalker, the Jedi hero of the Rebel Alliance, his disappeared under mysterious circumstances. From the ashes of the Empire has risen the First Order. 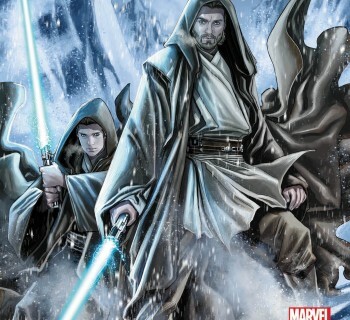 This sinister group, fronted by mysterious villains, has the goal of hunting down and killing Skywalker, thus eradicating the Jedi, once and for all. Standing in the way of the First Order is the Resistance, a group dedicated to halting their enemy’s goal to eradicate the New Republic. Old and new heroes must rise to the task to do battle against a weapon deadlier than any the Empire had ever utilized. (Note that this description of the film’s events reveals little more than the opening “crawl text” does, in an effort to avoid spoilers). 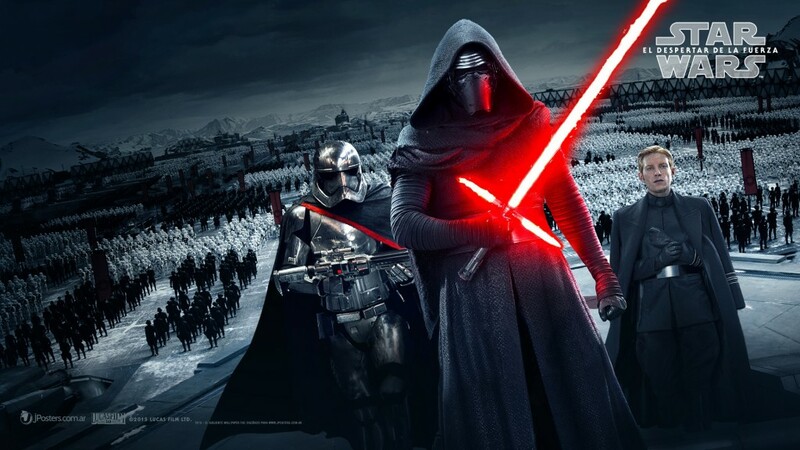 The mysterious villain Kylo Ren, shown with other agents and enforcers of the First Order. If you have seen JJ Abrams’ Star Trek reboot/sequel from a few years ago, you know very well that the man has a way of getting things done, and reviving a stagnant film franchise. While Star Wars Episode VII: The Force Awakens is not a perfect film, it is a solid installment set in everyone’s favorite galaxy far far away. This is the first Star Wars movie to be made without the involvement of George Lucas, following Lucas’ sale of LucasFilm to Disney in 2012. The lack of direct involvement from George Lucas himself has been something that has garnered mixed views from the fans. On one hand, the creator of the series, who created this galaxy we have come to love over four decades, is out of the picture, and the fate of the series is largely in the hands of a new crew. But on a more positive note, this rids the franchise of the weak direction and writing of Lucas himself, which plagued the prequels. The new faces of the Star Wars franchise meet many old favorites. 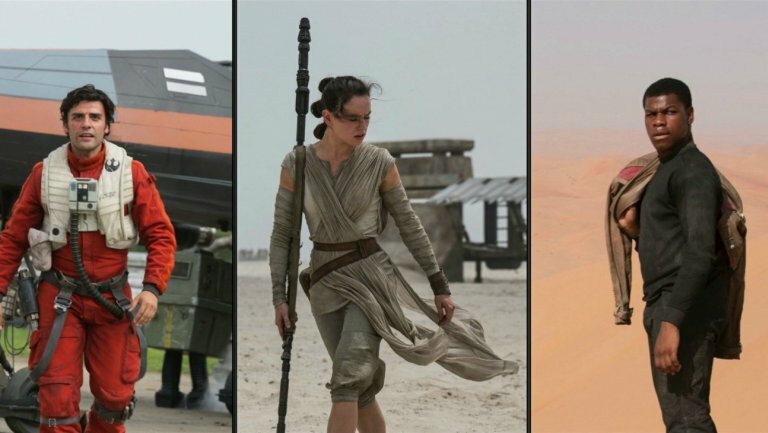 From left to right - Oscar Isaac as Poe Dameron, Daisy Ridley as Rey, and John Boyega as Finn. The film features a mixture of new and familiar faces. New heroes portrayed by Daisy Ridley and John Boyega occupy a bulk of the screen time, and they definitely help to give this film a feel of its own. As these heroes have origins quite different from those of older heroes in the franchise, the film definitely manages to hold its own and feel all the more unique. Of course, familiar faces like Han Solo, Leia Organa, and C-3PO show themselves as well. Everyone gives a great performance, and even the “old” characters from the Classic Trilogy portray their characters in a fashion that stays true to those classic films that, for the most part, the Prequel Trilogy could not possibly rival. But does it look, sound, and feel like a Star Wars movie? The answer to all three is a resounding YES. The look of the film is perfect; you are going to see spaceships, lightsabers, aliens, and exotic worlds as only Star Wars could present. Additionally, longtime Star Wars film score composer John Williams returns to the series; his familiar themes of the past can be heard here, combined with all new ones. From start to finish, Williams shows the world all over again what makes him the only man fit to score this classic franchise, past and present alike. Familiar and new elements alike come together here; another welcomed returning talent to the franchise is writer Lawrence Kasdan, who has previously contributed to The Empire Strikes Back and Return of the Jedi, and that may be a big part of why this still manages to feel like a Star Wars movie, more so than the prequels (note that Kasdan has revealed this will be his final writing contribution to the franchise, aside from contributing to a forthcoming Han Solo anthology film). 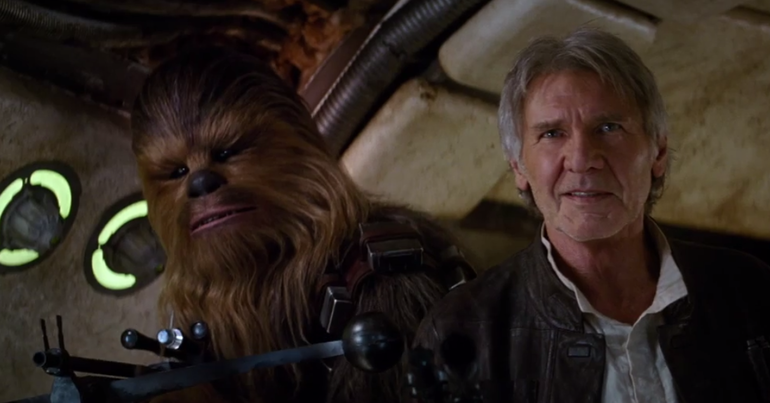 We get several of our old favorite characters returning, including Harrison Ford as Han Solo. Okay, the film is not perfect. The biggest flaw is one that is coming up in many reviews; the film feels a little TOO familiar at times. Those same reviews state that the movie, at times, feels too much like a remake of the original 1977 Star Wars (AKA Episode IV: A New Hope); I will not say exactly why this is the case as I do not want to spoil any major plot points. Striking a balance between familiarity and something new and unique is a challenge, and while the film is more than a success than a failure in this regard, the parallels between this movie and the original did become a bit distracting and tiresome at times. Another problem is regarding screen time of certain characters, or in most cases, the lack thereof. A number of classic characters appear in the movie, but the majority of them are relegated to the sidelines and feel like glorified cameos. Even one of the characters promoted heavily as part of the “new generation” of heroes introduced here is more or less cast aside for a good portion of the film, so we do not get to bond with that particular character as well as we should; nowhere near to the extent of Boyega and Ridley’s characters. MINOR SPOILERS IN THIS PARAGRAPH: There is one huge issue with the film that is impossible to discuss without at least minor spoilers. One of the things many fans (this one in particular) were looking forward to in the movie was getting to see Max Von Sydow, the legendary Swedish actor, who would be appearing in a role that was remaining mysterious right up to the time of release. Rumors galore circulated as to who he would be playing. Would be Boba Fett after escaping the Sarlacc? An aged Kanan Jarrus from the Star Wars Rebels animated series? An elderly Jedi or Sith? Actually, none of the above. Sydow portrays a village elder in the first five minutes or so of the film, who is promptly killed and forgotten (though his presence does play a role in setting the central plot of the movie into motion). Seriously, you hire one of the most legendary actors EVER to play in your movie, and just give him a role where he is essentially disposable? Fortunately, this was my biggest problem with the movie. END MINOR SPOILERS. Star Wars Episode VII: The Force Awakens is one of the most hotly awaited films of all time; it is already shattering box office records around the globe. Despite minor issues here and there, JJ Abrams’ take on the franchise proves to be surprisingly refreshing, and breathes new life into the franchise at large, much as he did with Star Trek a few years back. The Star Wars Sequel Trilogy is off to an impressive start, and sequels and spin-off anthology movies will be coming our way before we know it. In the meantime, get to the theaters and check out The Force Awakens. All images in this review are the property of Disney, LucasFilm, other associated entities. For promotional purposes only. All rights reserved. The opinions given in this review are strictly those of the author, and do not necessarily represent those of ZRock'R Magazine or any other entity. 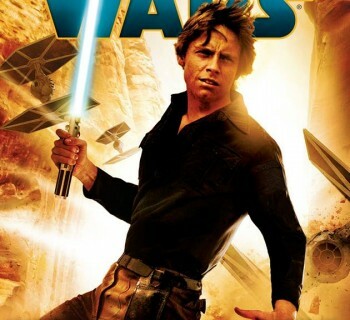 Heir to the Jedi - The Force is Most Definitely NOT with This Star Wars Novel!